In next weekend's action, the Lions will host the Bulls in Johannesburg, while the Reds will tackle the Rebels in Melbourne. 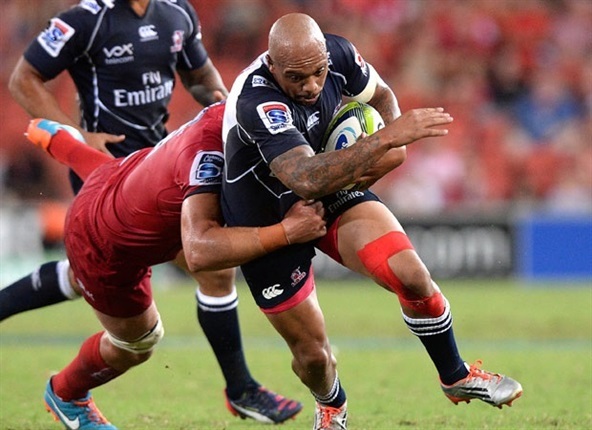 Be sure to follow out interactive commentary for the rest of the weekend's Super Rugby matches! Imagine being a Reds fan, watching that ending?! Going for a drop goal from a mile out and not rumbling it up with the forwards!? Well done to the Lions who have claimed their third win on tour - a record for the franchise! 80' - Will they set up a drop goal? 78' - The Reds win a turnover. They set up a lineout inside Lions territory. The TMO correctly rules that Feauai-Sautia lost control of it. Chris Feauai-Sautia almost over in the corner for the Reds, but it looks like his foot was in touch and he lost control. Great tackle by Andries Coetzee! 73' - Boshoff is now on for the Lions. He's at flyhalf, with Jantjies moving to inside centre. 71' - PENALTY slotted by Jantjies. 70' - The Lions hit right back when a Reds players transgresses on the ground. Ben Tapuai the culprit. 69' - CONVERSION by Cooper. 67' - Centre Samu Kerevi scored for the Reds after a slick backline move from the hosts. 67' - TRY to the Reds! 63' - TURNOVER! Tecklenburg wins a penalty on the ground to bring relief for the Lions. He has been everywhere tonight! 62' - Lions sub: Muller, barely on the field for the Lions, has been replaced by Kriel. 60' - Lions sub: De Klerk on at scrumhalf for Cronje. 57' - Some fancy footwork from Cooper puts the Reds on attack inside the Lions half, but then another knock-on leaves the hosts frustrated. Replacement Ben Tapuai the culprit this time. 56' - Lions sub: Muller on at lock for the Lions, replacing Kruger. 52' - CONVERSION by Cooper. 52' - PENALTY TRY to the Reds after completely demolishing the Lions scrum there. Great defence from Ross Cronje stopped the Reds just short of the line. But the hosts will have a five-metre scrum. Ruan Combrinck is sent to the sin-bin after cynically taking Reds scrumhalf Will Genia out close to the tryline. 49' - CONVERSION slotted by Jantjies. 48' - The Lions pounce on a loose lineout from the Reds and Warwick Tecklenburg barges over close to the uprights! 48' - TRY to the Lions! 48' - A terrific kick from Andries Coetzee brings play deep into the Reds 22m area. That was a good 65m! 46' - Lions sub: Redelinghuys on for Dreyer. Reds maul not making a lot of progress but the ball is secured. Chance of a drop goal here as Cooper starts to go back in the pocket. Hooter sounds, what will the Reds do? Cooper goes back... charged down! Lions win! A third win on the road for the Lions and in dramatic fashion at the end! Reds didn't take their chances and there was too much pressure on Cooper there for him to get it away. Lions clinch it by a point. Nice scrum from the Lions with Whiteley carrying off the base, but the Reds win the penalty! Turner striking it long to touch into the Lions 22. It's all set up for a great finish. Steady scrum from the Lions and Jantjies sticks in a great clearance. Reds having to start again. Long way to go but Faingaa is given a dreadful pass as the Reds cough up a scrum. Two minutes to go and that might be that. Lineout off the top from the Reds as Kerevi puts in a big carry. Super hands as Feauai-Sautia just goes into touch trying to make the corner. Looked like a forward pass or two beforehand. And he's dropped it. No way this is going to be given surely. Eventually it's no try, scrum to the Lions. Penalty to the Reds! Cooper kicking this one long to touch. Time running out for the home side. Lions secure the ball off the restart and now patiently keep hold of it, before a big tackle from Feauai-Sautia forces it loose. Reds scrum. PENALTY, LIONS, JANTJIES! 17-18: The ball rolls off the tee but Jantjies gets it back on there and then slots if through! Reds chasing the game again. Lions in great position with the lineout from the restart. Penalty! Tackler not releasing and the Lions can take back the lead. Suspect pass from Whiteley in the build-up but it''s not ruled to be forward. CONVERSION, REDS, COOPER! 17-15: Cooper gets the conversion and the Reds are into the lead. TRY, REDS, KEREVI! 15-15: Super move from the Reds as Cooper is released on an inside ball! The Reds recycle close to the line and all 108kg of Kerevi powers over the line for the score. Gunn on for his Reds debut as they chase the game here. Good drive at the scrum but no penalty, we'll reset. Stolen lineout by the Reds, back up to the Lions 22. Ball all over the place and it ends with a Lions knock-on - frenetic stuff there. Scrappy lineout for the Lions who eventually secure the ball and clear through Jantjies. Reds win the lineout and attack, reaching the 22. Nice run from O'Connor but then he's penalised for holding on, Tecklenburg forcing the penalty. Vital moment that one. Lions lose possession in the tackle before Turner sticks it in the corner with a smart kick. Good field position for the home side. Reds get the maul going but then they're penalised for obstruction. Jantjies clears the danger. Penalty Reds! More scrum dominance and Cooper will stick this as close to the corner as he can. Inside the 22. Solid scrum from the Reds who then clear. Lions respond by kicking to touch but Turner goes quick, before Cooper puts on some footwork. Put down by Tapuai and the Lions get a scrum. CONVERSION, REDS, COOPER! 10-15: Two more from Cooper and the Reds close the gap. Lions with the lineout on the far side and they catch and drive. Driven back in the tackle but Tecklenburg makes those metres back, before the ball goes forward. Reds trying to run it but there''s no advantage, back we come for the scrum. PENALTY TRY, REDS! 8-15: So much power coming through that scrum from the Reds and as the Lions try to twist the referee awards the penalty try! Game back on. No clear confirmation that Browning has scored so the Reds will get a five-metre scrum. YELLOW CARD, LIONS, COMBRINCK! Reds a metre or so out from the line, Kerevi with the initial break. Hand in the pocket by the referee and the Lions are down to 14! Combrinck in the bin. CONVERSION, LIONS, JANTJIES! 3-15: Easy two from the fly-half and the Lions have a big lead now. TRY, LIONS, TECKLENBURG! 3-13: Shocker from the Reds at the lineout and the Lions score! Whiteley with the steal and Tecklenburg has the power to get over the try line. Big moment. Lions then with the scrum in their 22. Just away by the visitors after a good drive by the Reds but Coetzee kicks long with a brilliant kick, putting the Reds right back near their five-metre line. He won't hit one better than that. Reds scrum holds before Kerevi crashes the ball up. Slow ball but they're in the Lions half. Double round by Cooper as the Reds keep it going, O'Connor tearing through a gap. Needs support and gets it, Kerevi with a half-break but he can't get the pass away. Better from the Reds. Lineout won by the Reds who kick long through Cooper, looking for territory. Reply from Coetzee is a good one but the Reds go quick - Cronje running it back to halfway. Lions making ground but then the ball is lost forward at the ruck. Lions with a lineout inside their territory. Good kick then pins the Reds back into their half, with Faingaa down for treatment before they take the lineout. Mastriet looking dangerous every time he gets on the ball as the Lions go for one final attack. Reds think they've turned it over but it's a penalty to the Lions, tackle on the man without the ball by Faingaa. Jantjies with the chance for three points before the break. PENALTY, LIONS, JANTJIES! 3-8: He gets it! Jantjies slides it inside the post and the Lions will take a five-point lead into half-time, which is just reward for a first half where they've had the majority of possession and showed more cutting edge. Reds with a lot of work to do. Jantjies then to get the second half underway - will the Lions picks up another win on the road? Reds back on the ball as Cooper looks for space at the back, but Cronje is there. Cooper with a chip and chase but Mastriet gets there first. Lions deep in their half trying to carry it but they run out of room and end up in touch by halfway. Jantjies sticking up a high bomb but the Reds gather and Turner clears away to touch. Lions still in a good position to strike before the break. Another good scrum from the Lions, who win another penalty. Jantjies gets the visitors out of their half with a kick to touch. Reds back in possession and looking to take the lead before half-time. The ball though goes loose and the Lions will get a scrum near the far touchline. Browning losing it there in the tackle. Missed to the left by Cooper so the Lions remain in the lead. Fancy hands from the Reds with Cooper digging into his box of tricks, as they win a penalty on the edge of the 22. Cooper to kick at the posts. Lions find touch but the Reds go quick, Turner replying with a low diagonal drive that pins the Lions back. Reds just lacking that finishing touch at the moment. Faingaa running well for the Reds as O'Connor gets involved. Cooper tries to kick but it's charged down, Mastriet clearing before the Reds start again. Cooper kicks deep. Super line from O'Connor opens up the defence and then Cooper's wide pass is nearly picked off by Combrinck who knocks on. Reds in a good position with the scrum. Untidy lineout for the Lions but they do get the ball back and Cronje clears, with Cooper nearly caught out by Mastriet on the chase. Ruled as a knock-on, so a Reds scrum. Penalty! Dreyer not driving straight. Good position for the Lions as they cross the Reds 22. Stolen! Schatz the man on the ball as Genia then thumps it away. Reds hanging on a little bit. Excellent scrum from the Lions as they win the penalty, Talakai struggling there for the Reds. Jantjies finds touch in the Reds half. Free kick to the Reds who are off, keeping the ball in hand. Basic drop from O'Connor there and the Lions have the scrum, some rustiness by those returning Reds players. Lineout tapped down by Mostert and goes straight through the hands of Cronje before Horwill knocks on. Lions scrum as the game starts to get a little bit scrappy. Penalty Lions! Slipper penalised for driving in and Jantjies will get a chance to clear, which he does well over halfway. Reds now on the attack in the Lions 22 but that's a small knock-on from Genia, giving the Lions a scrum. Poor pass from Cronje puts the Lions under pressure in their 22 but now it's opened up for Vorster, who finds Mapoe as the Lions cross halfway. Lost forward though by the Lions and the Reds will have a penalty after Dreyer played it on the ground. Cooper drills it to touch. TRY, LIONS, VORSTER! 3-5: Excellent finish from the 21-year-old for his first score in Super Rugby. Lions on the board. No conversion from Jantjies out wide so the lead remains two points. Better from the Lions who win the restart and then try to launch an attack, but that's another turnover for the Reds as Kerevi thumps it to touch. PENALTY, REDS, COOPER! 3-0: Good start for the Reds and they get their reward with three points. Lineout won by the Reds as Kerevi and Hanson have carries. Genia and Cooper trying to work a breakthrough. The ball is practically caught by the referee but the Reds have a penalty anyway and Cooper will try to kick three points. Cleared initially by the Lions before Kuridrani runs it back with interest. Another penalty for the Reds and back to the corner they go, this time on the opposite side. In a good position. Couple of resets at the scrum before the Lions win a free kick. Penalty Reds! At the breakdown again for holding on. Cooper finds touch. Possession for the Reds who are over halfway. Genia with a kick to the corner but it rolls dead past the try line, overcooked it. Lions scrum back on their 10-metre line. Mostert takes the lineout but the Reds turn it over, with possession by halfway. Super steal by Tecklenburg on Turner as the Lions attack, building up the phases and into the 22. Reds win the penalty though, Thomson with the play at the breakdown. Restart taken by the Lions who spread it wide with little gain, clearly trying to set the defence. Neat grubber down the line gathered by Cooper and the Reds clear through Genia. Hello and welcome to our coverage of this Super Rugby clash between the Reds and the Lions at Suncorp Stadium in Brisbane. Six of the big guns have returned for the Reds. Cooper will start at 10 Greg Holmes returns via the bench. James O?Connor will start on the wing while there are also returns for Lachlan Turner, Samu Kerevi and Ben Daley. In the Lions camp a few rotational changes were made with Elton Jantjies starting ahead of Marnitz Boshoff at fly-half. He wil be joined by Ross Cronje who takes over at scrum-half. In the forwards, Robbie Coetzee was given the starting berth this week. It's a dry clear night in Brisbane as the Lions take the field. Perfect for running rugby. Plenty of attention on Cooper as the Reds take the field. Referee Glen Jackson is ready so we're all set to get underway. Here we go!